So it has been quite some time since I have done any blogger tags and I thought seen as though I was feeling a little relaxed today , I would give another a try in the hope that I could get some of you lovely ladies to have a go. I love finding out all of your bad habits and how better of a way than to tag you into something like this lol. I am not perfect and neither is anyone else so when I hear of others bad habits I know I am just as normal as anyone else and that makes us all feel better . 1. Name a beauty regime that you rarely do? Body exfoliation, I am terrible at remembering . I know its something I should be doing to get rid of all those yucky dead skin cells but I am sure I just switch of over the colder months and when it comes to summer I do tend to do it quite regular. 2. Is washing your make-up brushes something that you do regularly? Ooh I have to , I can not stand grubby makeup brushes as it shows on my face , all that bacteria gathering in the bristles, eeew! I am however terrible at forgetting about the sponges which are just as bad. 3. How long will you last with chipped nail polish? Not even a day , I strip it as soon as I see a tiny chip of nail polish and it aggravates me so I end up redoing them. An even worse habit I can not abide is picking at nail polish and this is what I tend to do if it starts . 4. How long will you put off buying/replacing a beauty product, even if you need it? As long as I can , I usually have backups in case it ever happens though. If I do find myself ran out it does not usually bother me unless it is something I really do need for going out to an event like foundation then I would kind of go and get it as soon as I realise. 5. What is your worst beauty habit? It has to be picking at my finger nails , it grosses my husband out when he sees me doing it but its not as bad as him leaving his toe nails around so I don't know what the fuss is about. 6. Name something non-beauty and beauty related that you put off doing all the time? Reading, I love to read but always find something else instead to do even when I have the spare time to relax . I always forget or never curl my lashes , It does not seem to work however I try it so there simply is no point trying to curl those tiny lashes. 7. When going out somewhere, do you leave getting ready to the last minute? I am always a last minute gal, I can leave it 10 minutes before I start to apply a full face of makeup . Its one of the nightmares I have as I can decide it is going to be a no makeup day then change my mind in a flash. 8. Can you commit to spending bans? I do not spend a lot anyway , I am pretty good with buying only things I really need , If there is something I want as a treat my husband will usually surprise me if I'm nice to him , If not blackmail works wonders. 9. How organized are your make-up and nail polish collections? I have just bought a new vanity / work station so all of my makeup and work pieces are all very well organised into drawers . I have separate drawers for separated pieces and my polishes are colour co-ordinated , I would say I have a problem with keeping my nail polishes too organised. If you have been tagged below then it is your turn to answer The Procrastinating Beauty Blogger Tag questions! Just Make sure you tag me or leave a comment below so that I can read your answers and if you did't get tagged then don't worry, just do it anyway! Just remember to post a comment linking to your post so that I can keep up with you and I would appreciate you letting people know that you found the tag here and using the Badge at the top. 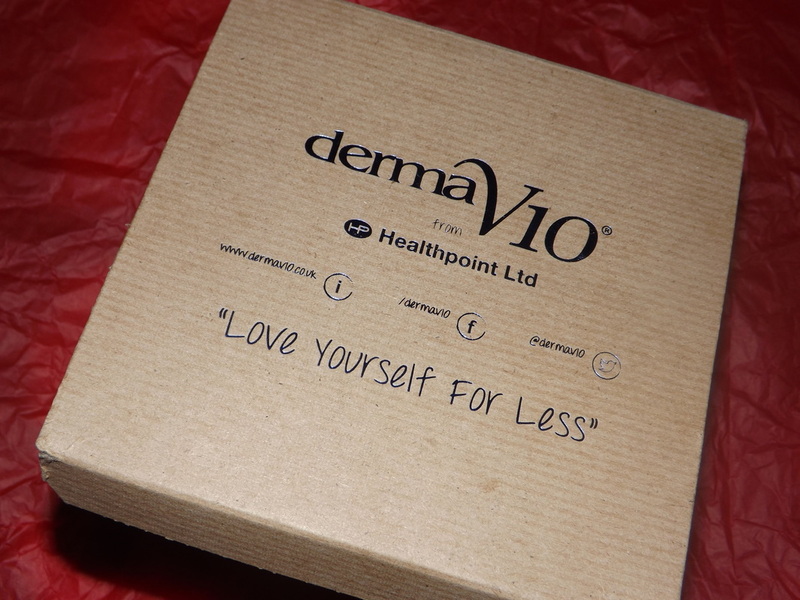 Two weeks ago , I was sat minding my own business on Twitter when I seen that Derma v10 were looking for beauty bloggers to review their new products . Of course I retweeted their tweet and said I would love to and look what turned up on my front door last week. Inside the box , there were 5 products, 1 of which I had already tried previously, but more on that later, let us take a look at the contents. The great thing about this box is that it is not filled with all the same area of body products, we have skin, hair and makeup items and I for one was quite impressed. So the first thing I noticed was the Cocoa Body butter in huge tub of 220ml. I have to agree this is one of my previous purchases that I bought quite some time ago , in fact I bought one of these tubs from Poundland last year, so this is not a newbie for me. Pure flavour indulgence, Derma V10 Body Butters are formulated for a rich thick texture, suitable for normal to dry skin, leaving your skin feeling nourished and healthy looking. AQUA, CETEARYL ALCOHOL, PARAFFINUM LIQUIDUM, STEARIC ACID, GLYCERIN, PROPYLENE GLYCOL, CARBOMER, PARFUM, TRIETHANOLAMINE, DMDM HYDANTOIN, EDTA, METHYLPARABEN, BENZYL ALCOHOL, CI 19140, CI 14700. I admitted that I had already tried this product before, but this time the formula has been changed and I am loving it. Previously the cream was thin and whitish in colour, there was also no scent to it but this time it is the total opposite. This cream has a beautiful orange tone shade to it, the cream is very thick , even for my thirsty skin and the aroma of that lushious cocoa floats out of the tub like melted chocolate . On the skin , the cream lays like a barrier of cold butter but once rubbed into the body, the cream soaks in well and in fact leaves a cool mintish tingling feeling, but I have no idea why that is as their is no menthol ingredients inside the product. My skin does not feel soft , it feels clean instead and there is no greasy residue left over once soaked in. I absolutely love the chocolate smell that is left over and I find myself keep opening the tub just to have a whiff of its glory. For me this is a nice cream, thick which I love, but to be honest it is not moisturising enough and the feeling I have after using it is as if I have used a cleanser , not a moisturiser. We actually tried these out first, we absolutely loved them and you can read my review on them here. The colours are vibrant but if you are looking for a pastel shade then these also work too. It says to use them dry or wet but I would say wet is the best way to get the result . We used a spray bottle to spray the end of the chalks then used the chalks as a pencil to draw the colour onto the hair. Find your creative side with Derma v10 Chalk It Up creative colour chalks which are suitable for use on damp or dry surfaces. Pink, red, yellow, green, blue, purple. Helps improve the appearance of scars and stretch marks. Safe during pregnancy and while lactating. Suitable for sensitive skin and has been dermatological approved and clinically tested. PRUNUS PERSICA (PEACH KERNEL) OIL, ISOPROPYL MYRISTATE, PRUNUS AMYGDALUS DULCIS (SWEET ALMOND) OIL, OENOTHERA BIENNIS (EVENING PRIMROSE) OIL, TOCOPHERYL ACETATE, PARFUM, CI 47000, CI 26100. Yes , you may have seen this one to in the Pound shop, its a bargain so why not , but is it totally worth the time in trying it? Being a mum , I know all about stretch marks and to be honest I have no interest in removing them. Some may think they look ugly but I see them as my babies map into the world and I for one think they belong to me, they are apart of me and I love them like they are my children. There are other stretch marks which I know are not part of giving birth though and those are the ones that are spreading down my top thigh and my hip and I do somehow feel like they get me down a little more than they should. 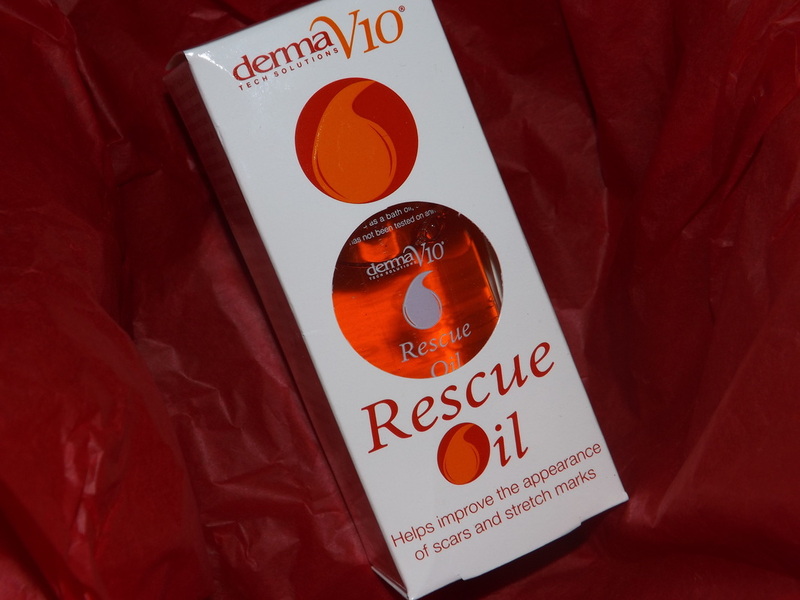 Over the past week I have been using the Rescue oil, maybe the stretch marks are already embedded into my skin, but they refuse to go. I have noticed that the oil has given my skin a hydration which has removed all blemishes that have began to grow with my ageing skin and I do feel if Ii continue to use it the scars will reduce over a few more weeks, but when you are paying only £1 compared to some of the leading brands rescue oils ridiculous prices buying a couple of these bottles in bulk would be my greatest tip . The oil it self is typical of its texture and scent and is very pleasant. I enjoy how it leaves my skin feeling after application . The skin is left feeling ultimately nourished, moisturised and even though it is an oil , I do not feel like I have been greased up as it soaks into my skin very well . I would most definitely recommend this to anyone who is interested in reducing scars, stretch marks or even hydrating the skin to moisturise and reduce blemishes or dry areas . This truly is a remarkable product , you should definitely give it a try. 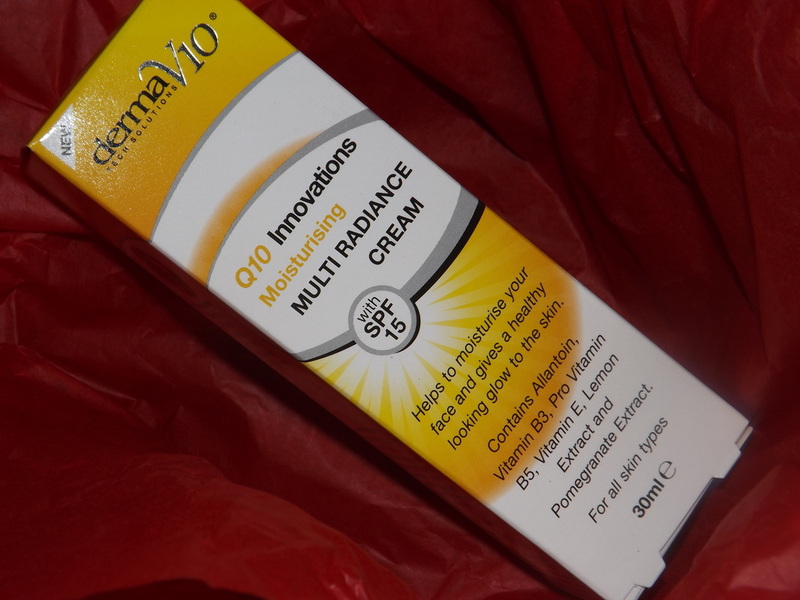 One of the new products from Derma V10 is their new Q10 Innovations Moisturising Multi Radiance cream. A mouthful I know but lets take a look at it and see what is so fantastic. Helps to moisturise your face and gives a healthy looking glow to the skin. Derma V10 radiance cream has been formulated with light reflecting particles which gives the skin a healthy looking glow. The cream is enriched with Allantoin, Vitamin B3, Pro Vitamin B5 and Vitamin E to moisturise the skin. The added SPF 15 helps protect your skin form the sun keeping your skin feeling younger and more radiant. AQUA, GLYCERIN, HOMOSALATE, OCTOCRYLENE, BUTYL METHOXYDIBENZOYLMETHANE, CAPRYLIC/CAPIC TRIGLYCERIDE, ARACHIDYL ALCOHOL, ARACHIDYL GLUCOSIDE, GLYCERYL STEARATE, PEG-100 STEARATE, STEARIC ACID, MYRISTIC ACID, PALMITATE, PHENYLBENZIMIDAZOLE SULFONIC ACID, DIMETHICONE, TRIETHANOLAMINE, PENTYLENE GLYCOL, SODIUM LACTATE, LACTIC ACID, SERINE, UREA, SORBITOL, SODIUM CHLORIDE, ALLANTOIN, CETYL ALCOHOL, CYCLOPENTASILOXANE, CETEARYL ALCOHOL, ALUMINIUM STARCH OCTENYLSUCCINATE, NIACINAMIDE, BUTYLENE GLYCOL, CITRUS LIMON FRUIT EXTRACT, PEG-8, PUNICA GRANATUM FRUIT EXTRACT, DIAZOLIDINYL UREA, TOCOPHERYL ACETATE, PANTHENOL, ACRYLATES / C10-30 ALKYL ACRYLATE CROSSPOLYMER, PHENOXYETHANOL ETHYLHEXYLGLYCERIN, DISODIUM EDTA, PARFUM, TITANIUM DIOXIDE, BUTYLPHENYL METHYLPROPIONAL, ALPHA ISOMETHYL IONONE, BENZYL SALICYLATE, CITRONELLOL, COUMARIN, GERANIOL, HEXYL CINNAMAL, LINALOOL, SILICA, CI 77891, CI 77491. I have to begin with the one thing I struggle with brands and their creams and that is the fact that usually brands make creams that seem to be different texture to suit different needs and I have found with all the creams I have tried with Derma V10 hold that one need for me which is thickness. The multi radiance cream has a lovely scent and it smells like a perfume I would actually buy if available from them. The cream is very thick in texture but that does not obtain itself from being light on the skin and I actually love how this feels . My skin is left feeling so soft and I myself can see a clear difference with only one use although the camera can not quite pick it up for you to see (just an excuse for you to go try it yourself ). The radiance really is the right word to be in this product , I wish my camera picked it up sorry. I see a healthy glowing look in my skin, not greasy at all . It is as if my skin has been instantly replenished and reborn, I truly love this product and along with the Rescue oil , they will be a big part of my new regime for sure. You should definitely give this a try , I am amazed by what it has done to my skin. Last but not least there was a lovely surprise in the box and that was their mascara and eyeliner. Yes I am admitting to the fact , I did not even know they had a makeup line and am very intrigued to share this with you. I received the mascara in black and the shape of the tube is like a silver nipped tip bullet which gives it a luxurious look to it. The wand is fantastic, I hate nothing more than a fibre brush tip where the bristles fall out and believe me I have had so many that have ended up making more a mess of my lashes than doing any good. 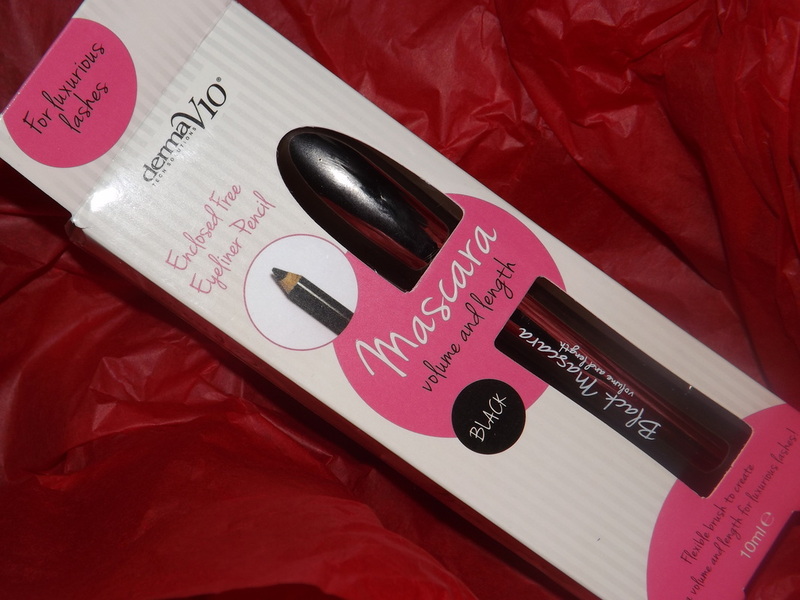 This mascara has a lovely rubber brush and is bendable enough to get into those small inner lash areas. I gave this little beauty a go straight away , and I actually loved how it attached to my every lash enhancing the length and shape of my lashes. So I have tried out all of the wonderful products in the box and I for one have been pleasantly surprised by the fantastic results each product has given me. 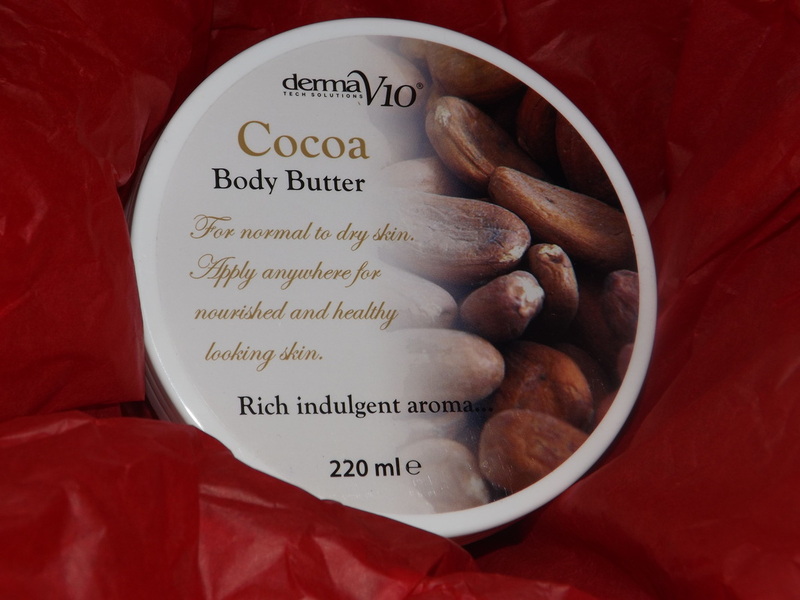 The Cocoa cream wowed me with its amazing chocolate cocoa scent but did not moisturise enough whereas the radiance cream pleased me by making my skin look reborn and revitalised. The hair chalks were fun and a fantastic creative idea for my children who thoroughly enjoyed the easy experience of hair colouring without the toxic chemicals or worry of ruining their hair. I would most definitely go out and buy in multi packs the Rescue oil and the Radiance cream due to the amazing results in which they left my skin looking even after one use and as for the mascara , well I am always going to say yes to a a mascara that lengthens my very stubby lashes instantly. 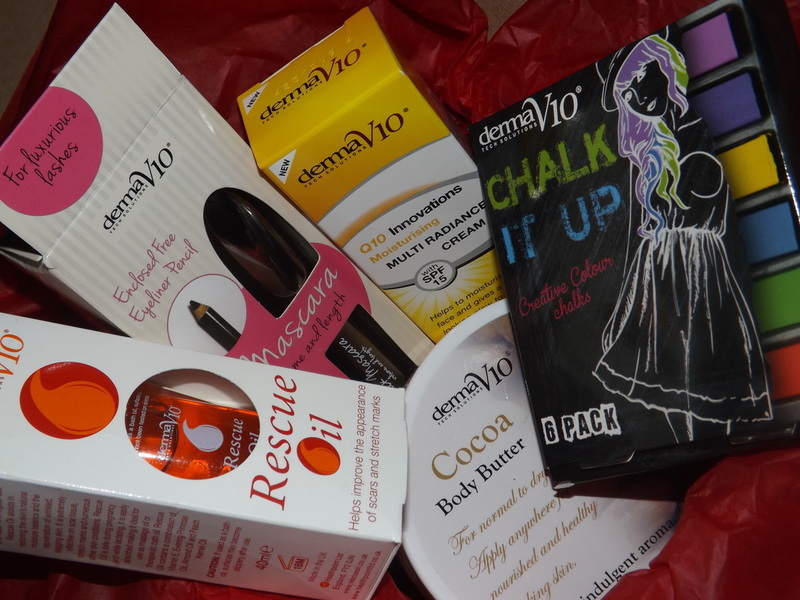 I would like to thank Derma V10 for sending me the box of products and also giving me the opportunity to find some new affordable body care items which have now been added to my daily regime as for me the Rescue oil and the radiance cream are the two things for me which everyone should be owning . 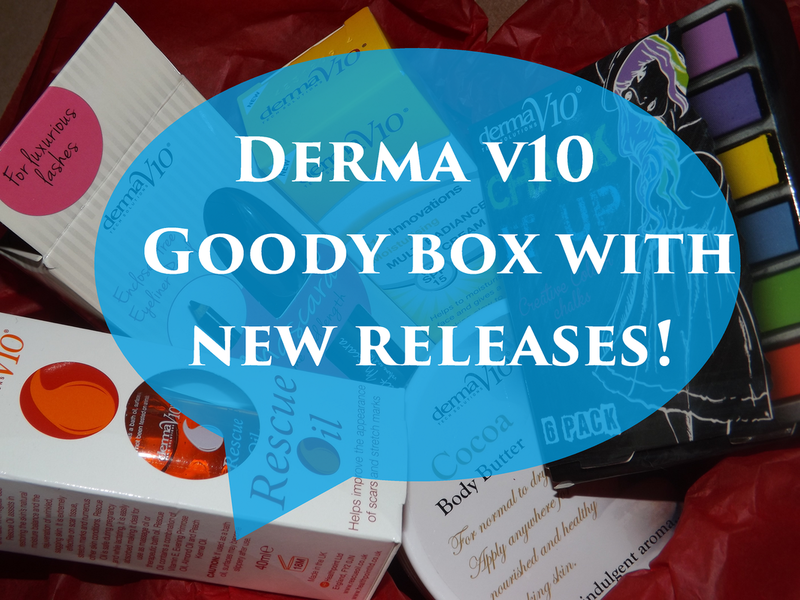 You can find out more about Derma V10 by visiting their Website or Twitter page . Billion Dollar Brows say that the eyebrows are the most important features of the face and I have to agree although sometimes it has been known for us to get it wrong . I remember only last year , I used to pretty much draw my eyebrows on and they looked so false that it was cringe worthy. Over the past year I have learned to get the shape and separation of the brow to a reasonable style and it comes easier with practice. The problem I have is that I have uneven brows and my left brow has a very thick indented scar which can be hard to disguise as it is right on the peak of where I would tilt my brow line. I have learned to use this to my advantage but using the right products is a must and it is not as easy as just drawing them on with a pencil or pen. Now for me, going to the salon and paying through the nose to get my eyebrows shaped , coloured and kept tidy is a daunting moment and I basically refuse to spend money on a service I know can be achieved at home for a fraction of the price. 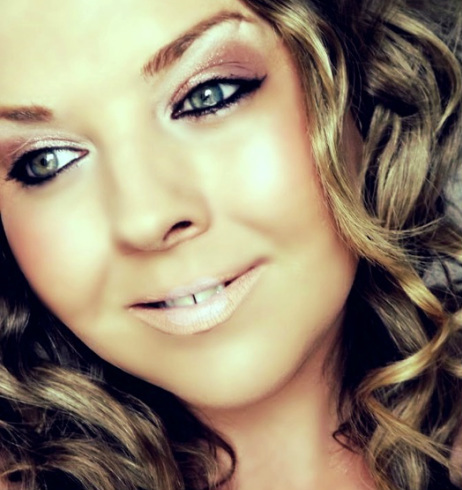 Last month I entered the Billion Dollar Brow competition last month which I had seen featured on keriehoy.com. Basically, all I had to do was share a picture of my brows on Twitter with the #Browfie and at the end of the month Billion Dollar Brows chose a winner . 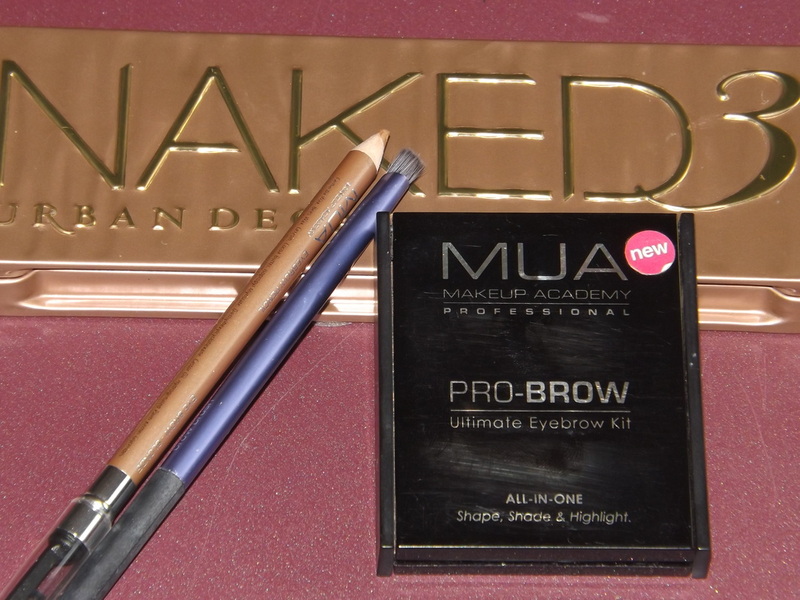 It is a monthly competition and you only need to enter once but if you are chosen you then get to choose a product to win from their selection of Brow products. On the 1st September I received the tweet saying I was August months winner , I was over the moon and instantly messaged them asking them for the Brow Powder in Taupe as the MUA kit I was using was running low and I was looking forward to a high quality brow shadow. Yesterday I received my parcel and inside was the Brow Boost, I think they must have been running out of the Brow Shadow but never the less it was something I had not thought of trying although I did need the shadow to replace my run low usual shadow. Brow BoostGet Thick, Full Brows & Lashes! Our Deep Conditioning Treatment is Designed to Help Strengthen & Condtion Thin, Over-Tweezed Brows. Natural formula with no scary side effects: prostaglandin free. So effective, you will see visibly fuller brows in as little as 30 days. A natural anti-aging solution: Fuller eyebrows create a more youthful look, without any risk or worry. Lab tested safe for eyes and skin: passed USA & EU regulations. With over five years on the market, Brow Boost is proven to work. Our loyal customers swear by Brow Boost’s ability to thicken and condition their brows and lashes -- and love its affordable,reasonable price too! Why pay more for less? Frame your face perfectly with full, thick brows. 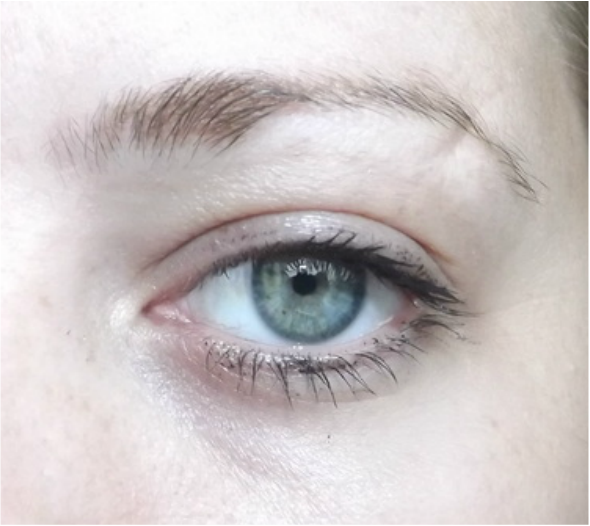 At our Beverly Hills Salon, we see uneven, asymmetrical brows every day. Brow Boost helps balance out uneven brows,putting your entire facial features back into focus. Pencil thin brows are so “out.” Brow Boost will help you say goodbye to thin brows and update your “look” with fuller, healthier, more defined brows. It’s so easy to use! Comes with a convenient brush-on applicator, just apply Brow Boost to your brows at night and leave it alone. Our natural formula dries instantly, in a matter of weeks your brows will begin to transform! INGREDIENTS: Water/Eau (Aqua), Propylene Glycol, Magnesium Aluminum Silicate, Hydroxyethyl Acrylate/Sodium Acryloyldimethyl Taurate Copolymer, Polysorbate 60, Squalane, Allantoin, Xanthan Gum, Methylparaben, Serenoa Serrulata Fruit Extract, Propylparaben, Triethanolamine, Diazolidinyl Urea, Laminaria Digitata Extract, Pelvetia Canaliculata Extract. Apply Brow Boost to sparse areas along entire brow line with the applicator. Use nightly. With consistent use, you should see results in about a month. 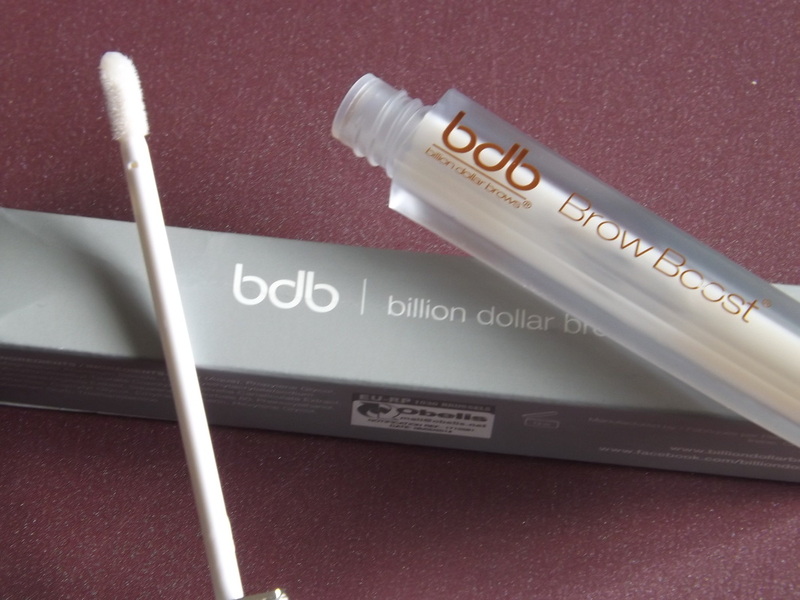 I am very much looking forward to using this product and am very greatful to be named as #Browfie of the month , thank you Billion Dollar Brows . I think the practice has paid of , I just need to keep taking my time, give them a natural look and not over do it with the pencil . If you wish to enter this months competition please take a look at the competition details , best of luck . 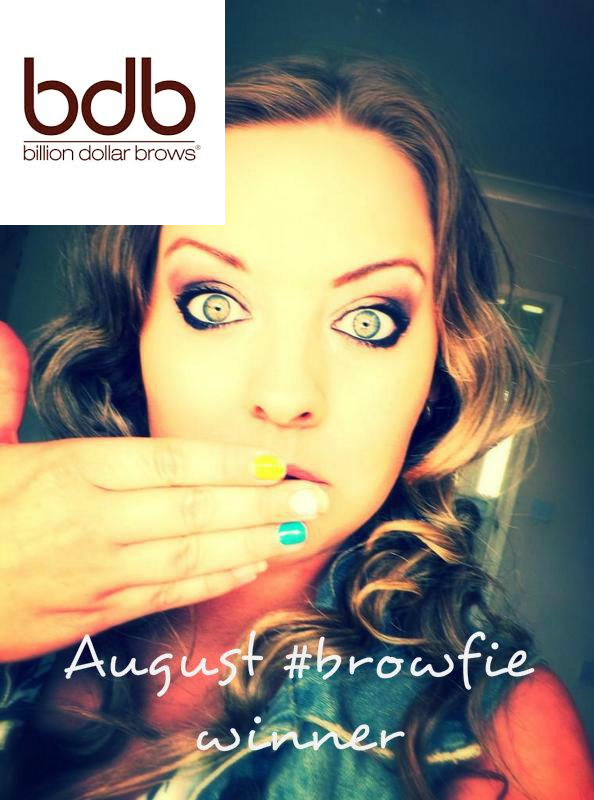 You never know , you could be crowned the September #Browfie winner next! For me , The person that smiles at me in the morning as they walk by is the person who makes my day better. A smile can be contagious and I for one try to smile at others to help their day start better. Strawberries contain powerful teeth whiteners that contain both malic acid (an astringent) and vitamin C.
The astringent in strawberries effectively aids in the removal of surface stains, while vitamin C whitens teeth by clearing away plaque. Summer is on its way, which means there is going to be a lot more photos snapping and flashing at you. I never used to be comfortable about my teeth not just because of the goofiness but because I neglected them a lot when I was younger. Two years ago I got my teeth professionally whitened for my wedding and have never looked back since but I did not like the cost of it nor did I like the sensitivity feeling it left afterwards. I have been looking for a natural whitening product and to be honest toothpastes are becoming some what of a pain . They just make my teeth sensitive and I love nothing more than enjoying an ice-cream in summer so don't wish for that . My love for food has grown as is the love of natural beauty products and I am loving the fact that there are so many new brands coming out with new ways to help and improve your skin but what about my teeth. 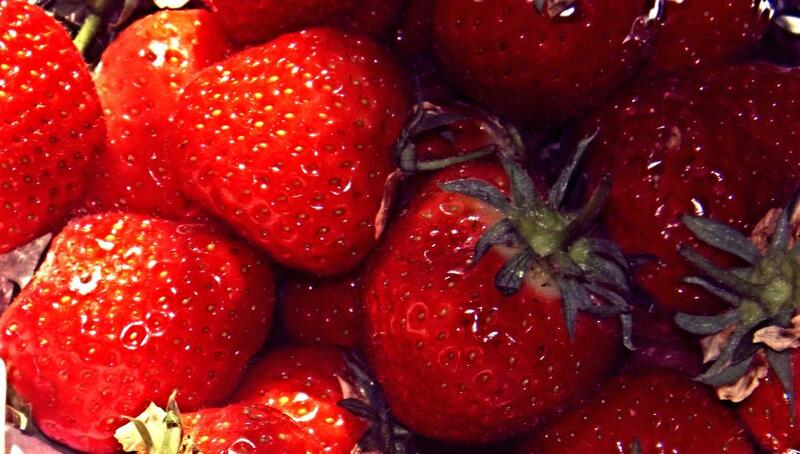 I have found out that strawberries are the answer . 1/2 teaspoon of baking powder. Crush the strawberry into a pulp. Mix in the baking powder and the muddled spearmint leaves to the strawberry pulp. Paint the mixture onto your teeth and allow to set for 5 minutes. Use a toothbrush to remove the mix from your teeth . So why are these ingredients included? Strawberries contain malic acid which is a natural astringent that pulls the plaque away from the enamel and also strawberries contain vitamin C which helps the lining of the gums (epithelium) stay healthy. Spearmint leaves are used to add flavour and an aroma to the mix also spearmint is good for the digestion and nausea. Baking soda is an abrasive compound that can remove the stains that are caused by drinking coffee, tea, smoking, etc. and the debris on the surface of the teeth to make the teeth appear whiter and brighter. So there you have it , a natural teeth brightening recipe for a brighter smile . Will you be trying this or have you?